It seems that Facebook Messenger earn positions in the IM free and wants to compete with some of the existing features in other services such as Skype or Tango. This is a new feature of free calls on Facebook Messenger for iPhone, allowing us to make calls between our Facebook contacts that have the app installed on your iPhone for free. 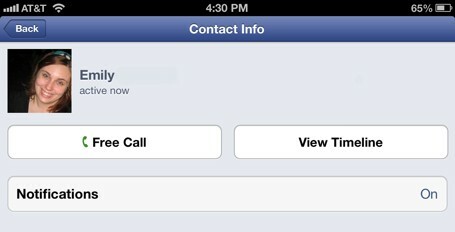 Earlier this month, Facebook Messenger launched a trial in Canada and today it has launched in the United States. The result? A toll-free service running smoothly. For integration into the device, it is said that even the application would need updating, but we should just open a new conversation with a contact and click on the info button, which appear free call option. When receiving a notification would come earlier call. Is all that is known at the moment, but if you are interested in the service we recommend that you be aware of upcoming reports, as the new boom in no cost calls could come soon to Spain.